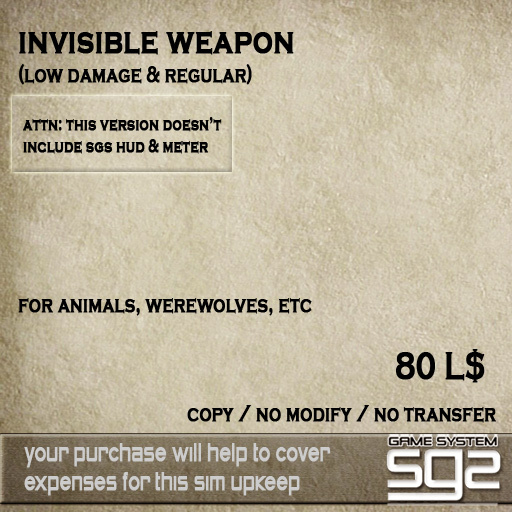 For animals and werewolves: we just released an ‘invisible weapon’. The box contains both regular weapon and low-damage weapon. In Golgothica all animals are prey, so they can only wear the low-damage ones. It contains low-priority animations, so your animal HUD will likely overwrite the default animations. If you have any problem with it let me know. In this version we added the stamina rate for Training Mode only (Physical Health and Stamina in Training Mode are now separate scores). Upgrades are free, and not mandatory. To get an upgrade, go back to the Game Room at the entrance, and click on the SGS Upgrade sign. The upgrade affects the HUD and Meter only. Food and Wine in the Palace is now offered for free to its members. On Friday evening 1 JULY we will open the new bazaar / landing area to the public. We feel that the new layout of the bazaar is much cleaner and you should all find a better and more visible place where to place your vendors. Also it is built on a straight line, so people won’t get lost in it. and find the place in the bazaar where you would like to move your vendors to. The available walls have a ‘rental’ sign on it, and they have no prims on it. When you find a wall where you wish to move to, please rezz your vendors there as well. If you don’t have your vendor prims, just rezz a big box in front of it, so I will know which wall you picked. There is no need to pay at the rental sign. By Friday I will do the transfer of the old rental to the new rental. Also you will be given 4 extra free days added to your new rental. We understand that you might not like any of it, and don’t wish to move. In that case, there is no need to do anything. When it is Friday, any pending rental in the old bazaar will be closed and refunded (if a new place is not chosen), and your prims will be returned. Also the new rental shows a price for the number of prims you use. The minimum number of prims is 11. That way will make you save some money on the rental price. We apologize for the inconvenience, but we strongly believe that the new bazaar is a huge improvement. ps: Contact me if you need further help. Merfolk have now a safezone all around the Isle of Mer (KoS2). We have just added a rolling pin and a frying pan as low-damage weapons (for preys). They are available in the Game Room at Golgothica. We just released SGS HUD v 2.07. I was asked to explain this, so here you go. In the upgrade, we accidentally added a flag making stealing from tills almost impossible. The flag has been fixed right now. This is just for a quick bugfix for transfer of owned prey when the name of the player was mispelled. Upgrade is optional and free. To get an upgrade of the HUD, just to go the game room and touch the sign on the wall. No need to upgrade weapons. You will now find that the new breed of rats in Ireem is back to full health and strength. 1.) Captures/Kills from distance were occasionally not counted. Now this should be fixed. 2.) The captures from Imp (and other situations) were successful with predators too (whoopsie). Now this has been fixed. FREE Upgrades available in the Game Room at the entrance. Attention: Co-tenants cannot share prims with multiple tenants. This is because it is impossible to know who you rezzed prims for, if you rezz for multiple people. If a cotenant is added to a rental, he will be removed as cotenant from any other rentals. All the rental boxes (door handle) has been upgraded to the new code. If you have any problem, let me know. Please DO NOT TELL THEM that they are cheating – because it is unlikely to be. If you are not sure about the game mechanics or you find that something is unfair or not working properly, please report it to Kora Zenovka (me), so I can tell you if it is a wanted feature or an accidental bug, and I will fix it. We have for a month, I guess even longer now, been watching Nomos. In that time it has been almost completely empty, apart from the occasional visitor. As we say repeatedly in our notes, a sim cannot exist if it does not at least support itself in paying its monthly tier, or demonstrating clearly that it has a purpose to exist beyond being a pretty picture. Nomos does not do that by a long way. So after some very serious consideration, we have decided to put it into storage for a while, very much in the same way as we had to do with Golgothica. We realise many players have put a lot of time and effort into making the place work in the past year or so. To these people we are, as always, extremely grateful. But, as always, there will be those who think we close sims in a casual, care less kind of manner. To such people I would ask them to spend the best part of a year pouring endless creativity, hard work and real money into a project, then close it, and see how they feel. Only then can they know how we feel. For ourselves, we have been very happy with the way Nomos turned out on a creative level, as for its success in SL, well as they say, you can lead a horse to water, but you cannot make it drink. But have no fear fantasy lovers. A new and slightly twisted phoenix shall arise from the ashes of the dead city very soon . We shall of course keep those who are interested updated on what comes next. We will close the sim to players and Visitors on Sunday 19th of June. NOTE: If you are renting either an apartment or a shop on Sunday, you will receive a refund by Uncle Ansome for the remaining rental. If you are a lawyer in KOS, please upgrade to this version. You should be able to receive and use the law item now. It is a bit different from what it was. Now level 1 lawyer get 1 item, 2nd level 2 items, etc. Your experience as lawyer will hopefully convince the jury of your client’s innocence. On top of that a random 1%-50% will apply on the final fee. A note on foul language swearing and cursing. We do not intend to police to heavily the language used in Role Play here in Golgothica. It is an adult sim with a strong sexual theme and therefore RP will inevitably contain heavy slang sexual references and outright offensive words. We hope that all are adult and intelligent enough to not use extreme disgusting language out of context or to bludgeon a victim repeatedly with the same old words over and over to the point of showing themselves up to be lacking in any word craft beyond these expletives. One thing is however outlawed completely, be that IC or OOC. There shall be no deliberate RL racist religious or minority group insults at all. In fact, this being a fantasy land, there should be no need at all to refer to any RL groups ethnic or otherwise. Because we will allow within reason the use of extreme language within the context of Role Play here, we will be forced to be far more strict about bad language used in out of character chat. If you get into an OOC argument do not swear at the other player, if you do so you will loose the initiative stoke the fire and make things worse for sure. We will ignore any OOC logs of complaints sent to us if the player complaining has used bad language themselves to back up their argument in any way. A note of caution here to players from different countries about using swear words etc from another country. Be very sure about how much offence you are causing before you use some words, they may be far more offensive and hurtful than you imagine. Think before you act and speak, and save us all a load of grief and drama. (This applies to all SGS SIMs, not just Golgothica).